^ Villoresi, Luca. Barbarigo Teschi e memorie. La Repubblica, Culture section: 35. [24 April 2009] （意大利语）. ^ Parker, Matthew. Monte Cassino: The Hardest Fought Battle of World War II. Anchor Books. 2005: 347. ISBN 9781400033751. ^ Crwys-Williams, Jennifer. A country at war, 1939-1945: the mood of a nation. Ashanti Publications. 1992: 358. ISBN 9781874800491. ^ E.D. Smith, The Battles for Monte Cassino, p. 26. ^ E.D. Smith, p. 27. ^ Fred Majdalany, Cassino: Portrait of a Battle, p. 30. ^ Atkinson, Rick. The Day of Battle: The War in Sicily and Italy, 1943–1944.. New York: Henry Holt. 2007: 344–354. ISBN 0-8050-6289-0. ^ E.D. Smith, p. 59. ^ E.D. Smith, pp. 63–64 & 68. ^ 17.0 17.1 Majdalany, p. 91. ^ E.D. Smith, p. 69. ^ 23.0 23.1 Hapgood & Richardson, Monte Cassino, p. 185. ^ Hapgood & Richardson, p. 169. ^ Laurie, Rome-Arno 1944, p. 14. ^ Gooderson, Cassino, p. 84. ^ Hapgood & Richardson, p. 203. ^ 46.0 46.1 Laurie, p. 15. ^ Molony, Vol. V, p. 802. 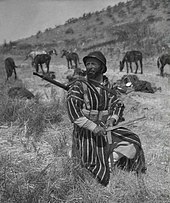 ^ Majdalany, Fred, (22 May 1913–15 Nov. 1967), Author, Military Historian and Journalist since 1933. Who Was Who (Oxford University Press). 2007-12-01. ^ The French Expeditionary Corps in Italy 互联网档案馆的存檔，存档日期2008-09-17. ^ Blaxland, Alexander's Generals (the Italian Campaign 1944–1945), p. 83. ^ 61.0 61.1 61.2 Molony, Vol. VI, p. 133. ^ 63.0 63.1 Majdalany, p. 256. ^ Anon, The Tiger Triumphs: The Story of Three Great Divisions in Italy, p. 81. ^ Lloyd Clark, Anzio: The Friction of War. Italy and the Battle for Rome 1944, p. 304. ^ Hapgood & Richardson, p. 31. ^ Hapgood & Richardson, p. 33. ^ 73.0 73.1 Hapgood & Richardson, p. 37. ^ Hapgood & Richardson, p. 38. ^ Hapgood & Richardson, p. 15. ^ Schrijvers, Peter. The Margraten Boys: How a European Village Kept America's Liberators Alive. Palgrave Macmillan. 15 Mar 2012: 99–100. ISBN 9780230346635. ^ McMahon, Barbara. Memorial unveiled in honour of allies who liberated Rome. 2006-06-04 [2018-12-02] （英语）. ^ Garvey, John. A Canticle for Leibowitz: A Eulogy for Walt Miller. Commonweal (Commonweal Foundation). 1996-04-05, 123 (7): 7–8. I went to war with very romantic ideas about war, and I came back sick. ^ Roberson, Williams H.; Battenfeld, Robert L. Walter M. Miller, Jr.: A Bio-Bibliography. Bio-Bibliographies in American Literature. Westport, CT: Greenwood Press. 1992-06-30. ISBN 978-0-313-27651-4. Blaxland, Gregory. Alexander's Generals (the Italian Campaign 1944-1945). London: William Kimber & Co. 1979. ISBN 0 7183 0386 5. Bloch, Herbert. 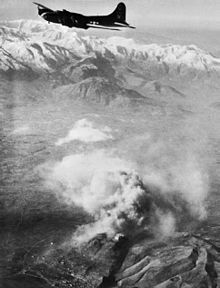 The bombardment of Monte Cassino (February 14-16, 1944): A new appraisal. Tipografia Italo-orientale. 1979. Böhmler, Rudolf. Monte Cassino: a German View. London: Cassell. 1964. OCLC 2752844. Clark, Lloyd. Anzio: The Friction of War. Italy and the Battle for Rome 1944. London: Headline Publishing Group. 2006. ISBN 978 0 7553 1420 1. Ellis, John. 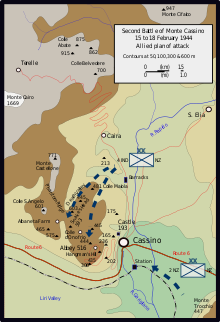 Cassino: The Hollow Victory: The Battle for Rome January-June 1944. Aurum Press. 2003. ISBN 1-85410-916-2. Forty, George. Battle For Monte Cassino. Ian Allan Publishing. 2004. ISBN 0-7110-3024-3. Gooderson, Ian. Cassino. London: Brassey's. 2003. ISBN 1-85753-324-0. Hassel, Sven. Monte Cassino. Cassell Military Paperbacks. Cassel. 2003. ISBN 0-304-36632-3. Hingston, W.G. 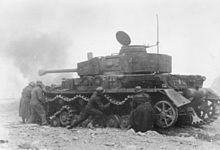 The Tiger Triumphs: The Story of Three Great Divisions in Italy. HMSO for the Government of India. 1946. OCLC 29051302. Katz, Robert. The Battle for Rome. Simon & Schuster. 2003. ISBN 978-0743216425. Krząstek, Tadeusz. Battle of Monte Cassino, 1944. Polish Interpress Agency. 1984. Majdalany, Fred. Cassino: Portrait of a Battle. London: Longmans, Green. 1957. OCLC 536746. Parker, Matthew. Monte Cassino: The Hardest-Fought Battle of World War II. Doubleday. 2004. ISBN 0-385-50985-5. Piekalkiewicz, Janusz. Cassino: Anatomy of the Battle. Historical Times Inc. 1987. ISBN 0-918-67832-3. Simpson, Albert F. Chapter 10. Anzio. (编) Craven, Wesley Frank; Cate, James Lea. Volume Three. Europe: Argument to V-E Day, January 1944 to May 1945. Section III - Italy. The Army Air Forces in World War II. University of Chicago Press on behalf of the Office of Airforce History. 1983 . OCLC 314452493. Singh, Sarbans. Battle Honours of the Indian Army 1757 - 1971. New Delhi: Vision Books. 1993. ISBN 81-7094-115-6. Smith, E. D. The Battles For Monte Cassino. London: Ian Allan Ltd. 1975. ISBN 0-7153-9421-5. Squire, G.L.A. & Hill P.G.E. The Surreys in Italy. Clandon, Surrey: The Queen's Royal Surrey Regiment Museum. 1992.
various authors. Monte Cassino : historia, ludzie, pamięć = history, people, memory. Askon. 2000. ISBN 83-87545-25-2. Whiting, Charles. Hunters from the Sky, The German Parachute Corps 1940-1945. Leo Cooper, London. 1974. OCLC 43073002. Phillips, N.C. Italy Volume I: The Sangro to Cassino. Official History of New Zealand in the Second World War 1939–45. Wellington, New Zealand: War History Branch, Department Of Internal Affairs. 1957 [2007-11-28]. Katri'el Ben-Arie. 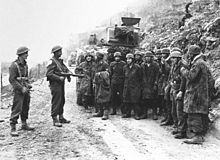 Die Schlacht bei Monte Cassino 1944. Freiburg im Breisgau: Rombach Verlag. 1985. ISBN 3-7930-0188-1. Janusz Piekałkiewicz. 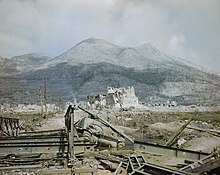 Die Schlacht von Monte Cassino. Zwanzig Völker ringen um einen Berg. Augsburg: Bechtermünz Verlag. 1997. ISBN 3-86047-909-1. E. D. Smith. Der Kampf um Monte Cassino 1944. Stuttgart: Motorbuch Verlag. 1991 [1975 (in English)]. ISBN 3-613-01095-X. Heinz Konsalik. Sie fielen vom Himmel. Klagenfurt: Kaiser. 2004. ISBN 3-7043-1329-7. Melchior Wańkowicz. Szkice spod Monte Cassino. Wiedza Powszechna. 1993. ISBN 83-214-0913-X. Melchior Wańkowicz. Bitwa o Monte Cassino. Warsaw: Wydawnictwa MON. 1989. ISBN 83-11-07651-0. Melchior Wańkowicz. Monte Cassino. Warsaw: PAX. 1990. ISBN 83-211-1388-5.
various authors. Monte Cassino. Warsaw: Askon. 2004. ISBN 83-87545-80-5. Janusz Piekałkiewicz. Monte Cassino. Agencja Wydawnicza Morex. 2003. ISBN 83-7250-078-9. Zbigniew Wawer. Monte Cassino 1944. Bellona. 1994. ISBN 83-11-08311-8. Piotra Sych. Сьмерць і салаўі (Death and nightingales). 1963.
various. Беларусы ў бітве за Монтэ-Касіна. Minsk: Беларускі кнігазбор. 2004. ISBN 985-6730-76-7. Google Videos. The Battle For Monte Cassino.